Ageless: Ukulele master Bill Tapia was born New Year's Day, 1908. He celebrated with two birthday concerts at rRed Elephant last week. 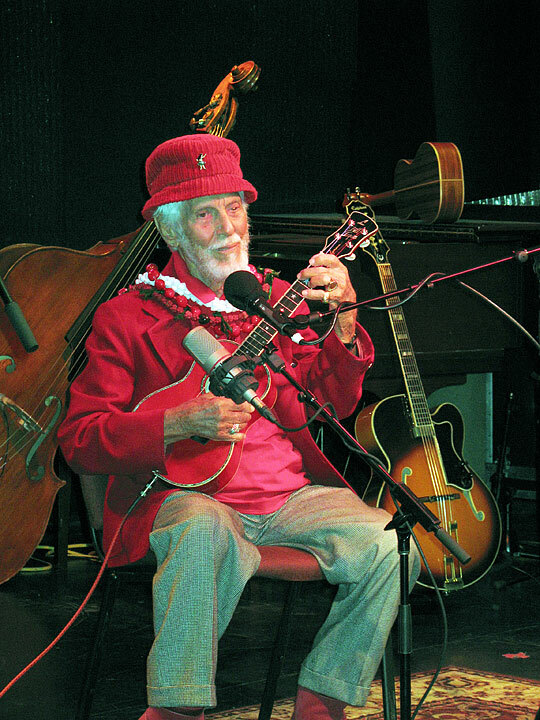 "I'm the only 99-year-old still performing in the U.S.," he said. Dressed in checked trousers, red blazer and red shoes, he romped through songs like "Manuela Boy," with lyrics that sounded quite racy seven decades ago. Mihana Souza ducked in late after her set at Duc's Bistro, took the stage with a "Hi, Uncle," and proceeded to sing old jazz tunes she learned from her father. "Uncle Bill's the only one who still knows them." Back in the day, Tapia had a reputation as a ladies' man. "Haven't changed," he asserts. "I'm still looking for a girl." Love is on the air: "I'm Mr. Romance," insisted TV producer Phil Arnone, an extravagant claim for someone who was doing nothing more romantic than shopping at Costco at the time. Arnone is finishing up a KGMB special, "Romance in Hawaii," featuring couples like Jack and Cha Thompson, Buffalo and Momi Keaulana, Karen Keawehawaii and Jackie Farias, plus home movies of Lucille Ball and Desi Arnez vacationing in Hawaii in the '50s. You'd think it would air Valentine's Day, but it's scheduled for Feb. 20. Hosted and with music by Matt Catingub, it's a run-up to Catingub's ambitious 11-day "Return to Romance" music festival, which kicks off March 1. Confidence: Jimmy Borges is featured on the "Romance in Hawaii" TV special, both as a singer and as a couple with wife Vicki. Jimmy recently got an e-mail from an old girlfriend. She was going to be in town, with her husband, and wanted to have dinner and recall old times. "OK if we go?" Jimmy asked Vicki. Vicki, who shed 18 pounds to celebrate her last birthday, put a smile on her face and her hands on her hips, and said, "Bring her on." Good week for romantic items: Did you know that Brother Noland introduced Dem Party Chairman Mike McCartney to his wife, ophthalmologist Candace Furubayashi? Noland invited McCartney, and Noland's wife, Heidi Ho, invited Furubayashi to the same concert. "It was a setup," says McCartney. McCartney, still consulting with PBS Hawaii after resigning as chief executive officer six months ago, insists that he had nothing to do with Brother Noland being featured on an hour-long Na Mele special this Thursday at 8 p.m.
Juice: Last Thursday, talked to Mona Wood as she was rushing out the door to teach a model how to hula, for Non-No, the trendy Japanese fashion magazine. "I'm not taking my CD player like I usually do," she said. "The batteries always run out." Instead, she was dragging along her guitar-playing husband, Max. Said she, "I think his batteries are still good." Sign for all seasons: You expect state government to be slow, but, hey, it's almost February and the "Seasons Greetings" banner is still up on the Aliiolani building, home of the state judiciary. Normal: Jeff Apaka is a little huhu. Last year, he had 35 teams for the Waikiki Community Center's Ala Wai Challenge. This year he's scrambling to get 30 for the fundraiser, which includes a canoe race down the Ala Wai Canal. The objection is that the canal's dangerous. "I've got letters from the Department of Health right here on my desk," says Apaka. "The Ala Wai is back to normal." Whether normal's good, I'll leave up to you. But if you hurry, you can catch the festivities. They're today. Trumped up: Early buyers are already flipping the condos in the as-yet unbuilt Trump Tower Waikiki. "It's inevitable in a project that's generated this much excitement," says real estate maven Hugh Damon of RE/MAX. "The contract forbids it, but it's hard to prevent private side deals." Damon's advice: "Some Trump condos are $1,000 a square foot. If Waikiki real estate's going to get a wave, you're better off riding it with something that's $600 a square foot." Manana: For those on the Dog Watch, the Mexican court that decides whether to demand the extradition of Duane, Tim and Leland Chapman or to let sleeping dogs lie, has until Wednesday to render a decision. Sobering news: Veteran ad man Richard Tillotson and wife, UH prof Val Wayne, are going to be on West 36th Street in Manhattan tomorrow night, watching an Abingdon Theatre reading of Tillotson's new dark comedy, "Inside Out." "Be great to get a local production some day," says Tillotson. Who wouldn't love a play that begins with a half-drunk character saying, "Sobriety: It can strike any one of us at any time." Reality or TV? The stink over the MTV reality show "Maui Fever" has spread nationwide. The show depicts the lives of several young Kaanapali locals. MTV's idea of a local seems to be a blonde haole. Plus, the show's casual hook-up social life may not portray island culture at its finest. Created by Morgan Freeman, not the black actor, but the producer of the teen soap opera "Dawson's Creek," the show's apparently a disappointment to those who expect reality TV to have something to do with reality. Top dollar: Tonight at the Hawaii Prince Hotel, Hawaii Business Magazine will unveil its list of the town's top 20 financial advisors, useful information if your portfolio tops half a million. Morgan Stanley and Merrill Lynch each put five brokers on the list. Can't tell you who came out on top, but a certain good friend of the governor's is unlikely to be disappointed.